In my view, your column actually raises two interesting issues: First, do the arts and popular culture (including film) influence society, or is it the other way around; and, second, what do attitudes expressed in Stone’s film say about professionals working in financial markets, the America financial elites and the financial system as a whole? In quoting the memorable words in the film of Stone’s character Gordon Gekko that, "greed is good," you really are raising a larger question of whether unethical behavior was primarily responsible for the current crisis. Indeed, lack of ethics – – which undoubtedly was rampant on Wall Street in the period leading up to the crisis – – is a popular explanation for what happened. So it is interesting to explore the role of ethics, as well as Stone’s film, in the current crisis. Recently, Howard Jackson, your editor, wrote that the purpose of the Inquirer’s Commentary section is to stimulate debate and an exchange of ideas on important subjects of public interest. It is in that vein that I write to you. Starting with the influences of film, I think that, upon reflection, you have gotten the role of art (and film) exactly backwards: Life rarely imitates art; but rather just the reverse. The general proposition is that art (including film) holds up a mirror to life and society – – which is a good thing. In holding up a mirror to life (to culture, society, the political system, the family, human nature and so on), art has the capacity to discover and communicate significant truths about these subjects, even ones which are inconvenient and from which conventional wisdom shrinks. So what is the message – -the inconvenient truth – – of Stone’s film and how does it relate to the current crisis? In considering the meaning of Stone’s film, it is important to consider certain aspects of the film with which you might not be familiar and some of which Stone was apparently not aware, either. The back story to Stone’s movie was not the leveraged buy-out craze of the 1980s – – as you allude – – but rather the insider trading scandals of that period. 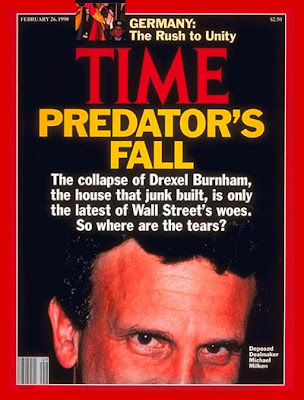 Moreover, the model for Stone’s protagonist, Gordon Gekko, was not a reputable figure (like those mentioned as being responsible for the current financial crisis), but was more of a Bernie Madoff type, Ivan Boesky. Boesky was simply a low-life stock trader who was thought to be uncannily adept at stock picking, but who was, in reality, paying people off for inside information and who got caught by the authorities. 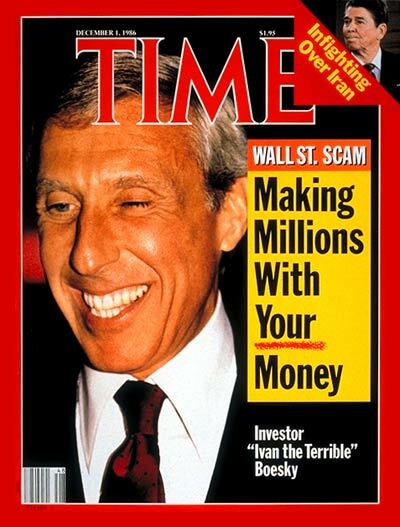 Rudy Giuliani did not either uncover or prosecute Ivan Boesky, but rather it was the SEC who discovered the illegal activities of another rogue trader, Dennis Levine, who turned Boesky in to the SEC. Boesky, in turn, informed the SEC about his passing involvement with Michael Milken, a true financial visionary of the 1980s who both was a major figure in the leveraged buy­out field and who single-handedly created an entirely new field of finance, the market for "non-investment grade" securities ("junk bonds"). It was Milken who Giuliani prosecuted and whose prosecution made Giuliani’s career. Had Stone’s film dealt with the complex motivation and actions of Michael Milken which were at once heroic and dishonorable, the film could have courted artistic greatness. However, Stone failed to take advantage of a golden opportunity to achieve possible film immortality and focused on Boesky which limited the scope and power of the film. And, in yet an additional irony, the phrase "greed is good" was not original to Boesky, either. Boesky’s speech-making, like his trading, was also phony – – plagiarized from others. Interestingly enough, Boesky’s source for his provocative statement about greed and finance originated from none other than the much reputed economist and pundit, the late Milton Friedman (a fact of which Oliver Stone was apparently unaware). It is in the context of Milton Friedman’s words – not Ivan Boesky’s – – that Gekko’s stark view of actions on the Wall Street takes on the potential for real insight, even wisdom – – but not for reasons which ever occurred to Stone or to which you alluded to in your column. Because of the importance in conventional thinking in attributing the excesses of Wall Street responsible for the current crisis to unethical behavior, it is worth pondering both the origins and meaning of Freidman’s views involving greed and finance. Milton Friedman was a leading economist and public intellectual in the United States in the early to middle post – World War II period. Freidman was the principal exponent of the so-called Chicago School of Economics and what has become known as the signature idea of the Chicago School pertaining to finance and the financial markets, the "efficient market hypothesis." Friedman was also the leading advocate in the U.S. of the free market system and market capitalism, believing in an extreme form known as laissez-faire capitalism (which has also become known as free market fundamentalism) and which postulated that markets were both self-regulating and self-correcting and that government intervention in the market system (including government regulation) would cause economic inefficiencies and harm the economy. In so far as financial markets were concerned, laissez-faire capitalism took the form of the efficient market hypothesis which postulated that the most efficient allocation and use of capital came about by the unfettered operation of financial markets and that open, unregulated markets perfectly established the economic value of financial assets. According to Friedman, the market and its vaunted efficiencies came about as a result of competition among market participants, so-called "market forces" and sometimes referred to as the "invisible hand" of the market. Because of the presence of competition, the self-interest of market participants cancelled itself out and was an engine of economic progress. Friedman argued that not only was economic self-interest not to be feared, but was a force for social good, because the effect of competition was to drive the system toward efficiency. Thus, Friedman argued the more unrestrained self-interest the better – – indeed, the greater the degree of naked self-interest exhibited in the market place, the greater the level and intensity of competition. Naked self-interest is just another term for greed, as Friedman recognized, leading him to conclude that, "greed is good." According to Friedman, the one and only worthy economic objective of corporations or individuals trading, not just in financial markets but in the economy as a whole was "to make as much money as possible," to "maximize profits," i.e. be as greedy as possible. In this way, the economic system would supposedly realize economic efficiency and maximize the economic welfare of society as a whole. Friedman’s views on capitalism and greed epitomize the current state of an extremely prominent economic philosophy in the U.S.: the laissez-faire, unregulated free market school of political economy. From an economic policy perspective, free market fundamentalist views amount to endorsing a form of economic organization (market capitalism, so called "free enterprise") based on acknowledged immoral motives and promoting or acquiescing in immoral activities in economic decisions and policy making. Supposedly, for policy reasons, society as a whole is better off with the free enterprise system than it otherwise would be, because – – not in spite – – of its reliance on the unrestrained exercise of self-interest (i.e. greed) in the market place. The reasoning is that the greatest good for the greatest number will result from the adoption of naked self-interest as the basic driver of the economic system. Alas, while there is substantial social scientific evidence supporting the general functioning of markets in accordance with a rough approximation of the tenants of neoclassical economic theory, there is no empirical validity to the broad, sweeping assumptions of free market fundamentalism and laissez-faire capitalism. The competitive free enterprise system (as a system) is neither self-correcting of market mistakes or changed circumstances, nor self-regulating against abuses and excesses. In fact, the apparent near instant replay of 1929 et. seq. with which we are currently contending demonstrates just the opposite. Nor is the efficient market hypothesis empirically true. Similarly, self-interest, or even competitive forces which it may generate, are not always engines of social good. Indeed, greed (or unrestrained self-interest) is usually just that – – and in need of restraint in economic decision-­making, as in life generally. To begin with, it is now abundantly clear that the efficient market hypothesis about financial markets is invalidated on a daily basis. Ask yourself who is the most respected stock trader in America? By a wide margin, the answer would be Warren Buffet. Buffet is the principal advocate in the U.S. of the "value" investing approach to stock market investing. In value investing, investors look for companies whose stock prices are undervalued by the stock market and which will rise in absolute terms and relative to their industry sector and the market as a whole. Under and overvaluation of stocks by the market is routine and represents the antithesis of an "efficient" market which postulates that the price of a stock at any given time always reflects it true economic value. If the efficient market hypothesis applied, stocks would never be under or overvalued relative to the market. In the 1980s, Michael Milken demonstrated that the exact same situation existed for corporate bonds. By establishing that the default rate on non-investment grade securities was relatively low, Milken showed that non-investment grade securities were grossly undervalued by the credit markets. By contrast, the recent sub-prime mortgage crisis has shown that mortgage-backed securities were grossly overvalued by financial markets. Even more troublesome than routine mispricing of financial assets by the "unfettered" operations of market forces in financial markets, the assumption that the financial markets, or even the economy as a whole, represent a self-regulating, self-correcting system is also demonstrably false. In fact, financial markets – – indeed, the entire money economy – – are inherently unstable and experience cycles based upon the expansion and contraction of credit. This phenomenon is dramatically illustrated by the current crisis which originated in unsound, speculative mortgage lending practices and which resulted in gigantic "asset bubbles" in real estate and finance, a crash and a paralysis of liquidity and a vast credit crisis leading to what you have described as a "financial melt-down." A "melt-down," "sell-off," "freeze," "panic," "collapse" – – whatever it is called – – is the antithesis of a market "correction." In fact, but for the drastic and unprecedented actions by the Fed and the U.S. Treasury which have flooded the financial system with liquidity, made massive amounts of capital available to financial institutions, and even gone so far as to guarantee certain private financial obligations, the value of financial assets in the U.S. would have totally collapsed and the operations of financial markets would have shut down completely generating a 1930s – style Depression. Thus, the current behavior of the financial system is not – – and has not ever been – -self-correcting. The financial crisis, in turn, has caused a collapse of the real economy, in a pattern eerily reminiscent of the Great Depression of the 1930s. An economy-wide contraction of economic activity has left the economy operating far below full capacity (including resulting in a massive increase in unemployment) where it would remain indefinitely, but for massive intervention by the national government to bolster and/or restart economic activity. Again, the current behavior of the economy is self-evidently not self-correcting. In response to the economic crisis of the 1930s, an entirely new field of economics was developed to explain what happened called macroeconomics or Keynesian economics. Then, largely like now, the prevailing economic orthodoxy was represented by free market fundamentalism. Then, like now, the collapse of the financial markets leading to a genuine implosion of the real economy was viewed as highly improbable – – before the fact. It was also said, at the time, that the financial markets and the economy would self-correct and return to normal – – at least "in the long run." 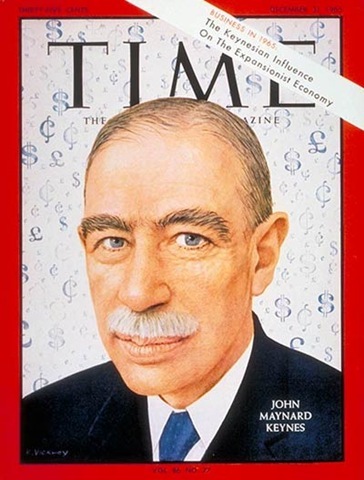 Keynes stunned the world of business and government with his brilliant explanation of the Depression as resulting from a collapse of aggregate demand caused by a financial market collapse stemming from a sharp, unexpected contraction of credit in response to unsound real estate lending by the banking system and financial speculation in real estate and stocks in the 1920s. Moreover and more importantly, Keynes showed that a pure free market system could stabilize indefinitely below full employment of its productive resources and, without outside assistance, would be unable to revive itself. Indeed, in response to the assertion of the then economic orthodoxy of a natural return to long-run full employment, Keynes responded, "Yes, but in the long-run, we’ll all be dead." Finally, it is equally obvious that unrestrained self-interest, i.e. greed, either by itself or in combination with competitive forces it may generate, is insufficient even to maintain stability in financial markets, let alone drive the financial markets to the efficient creation and use of capital. This has now been authoritatively acknowledged by none other than Milton Freidman’s intellectual successor and most recent high priest of free enterprise and laissez-faire capitalism, Alan Greenspan. In recent Congressional testimony and in response to the question of what went wrong in financial markets, Greenspan admitted to a "flaw" in his and Friedman’s "greed is good" logic: Namely, Greenspan had believed that self-interest would have prevented market participants – – both individuals and their firms – – from engaging in the risky, reckless financial speculation which imposed large losses on them and caused the current crisis. Self-interest and competition, far from disciplining the market, resulted in windfalls, either windfall profits or unanticipated, catastrophic losses. However, neo-con free-marketers fear not. All is not lost for the private property-market -and-self-interest driven economic system. Markets have been proven to work across a wide range of economic conditions, to be relatively efficient and to have produced, at least cyclically, high levels of income and employment. However, as the above analysis demonstrates, they have drastic deficiencies and flaws which render them neither self-regulating nor self-correcting. Markets, particularly financial markets, need to be systematically regulated by the government to prevent excesses and abuses by market participants and to maintain stability. Once again, we have learned that history will repeat itself, if society is uninformed or deluded enough to make the same mistakes of the past. We have also learned (once again) the heavy costs of free market fundamentalism and laissez-faire capitalism. It is, as they say, an expensive history lesson – – which was totally avoidable, and should have been avoided. First, art generally does not influence society, but it is the other way around. Second, it was not greed that brought down the financial system, but deficiencies and failures in the system, as Greenspan put it, "flaws" in the theory of free market fundamentalism and laissez-faire capitalism. The collapse of the market is NOT primarily a matter of values, but of system dynamics. If it were the former, we would have to get rid of the free enterprise system which is based on unrestrained self-interest as an engine of prosperity, and as, inter alia, an immoral system. However, from a public policy perspective, it is not self-interest that is wrong, since self-interest and the market forces which self-interest generates work at least partially to self- regulate abuses and excesses of the system. Rather it is free market fundamentalism and the belief that markets are always self-regulating and self-correcting which is wrong. Third, there undoubtedly was unethical (and illegal) behavior on a massive scale in the period leading up to the financial crisis and which was a contributing factor to its scope and magnitude. This type of behavior – – both in terms of negligence and intentional wrongdoing – -can and should be discouraged. But it was flaws in the market system, not the ethics of market participants, which was the principal problem. To quote the comedian Chris Rock in another context: "Don’t hate the player, hate the game." Fourth, the answer to the problem is to fix the system. Once again, experience shows that there is no such thing as a self-regulating and self-correcting economic system. As a result of the collapse of the financial system 70 years ago which resulted in the Great Depression, a mixed system of private markets and public oversight was instituted. Nor was the approach limited to the financial sector, but was extended to markets for labor (labor organizing, wage and hour, child labor, occupational health and safety, and anti-discrimination regulations) and goods and services (antitrust, environment protection, and consumer protection regulations and so on). The "mixed" economy of private markets and government oversight/regulation was the correct response to the financial/economic crisis of the 1930s. And a return to the mixed economy is the correct response now. Indeed, if you consider the fundamental challenges to the country now, such as energy, environment and health care, they are problems which the private market does not deal with well and as to which market forces will not produce least cost, let alone optimal, outcomes. Fifth, and finally, although it will be difficult for conservatives – – even moderate conservatives – – to accept, the overwhelming weight of historical evidence shows that the vaunted market system has flaws; that there is such a thing as the "public interest" which consist of the interest of society as a whole and which is greater than the sum all of the private interests in society; and that there is an important role for government – – particularly at the national level – – in protecting the public interest. Anyone who tells you differently is either a deluded ideologue or ignorant of history – -or both. Daniel Berger is an attorney in the field of complex litigation, including securities and anti-trust litigation, and has a broad-based knowledge concerning the structure and functioning of the US economy and US financial markets. He practices in Philadelphia. This entry was posted on Saturday, October 24th, 2009 at 2:14 pm and is filed under Phil's Favorites. You can leave a response, or trackback from your own site.